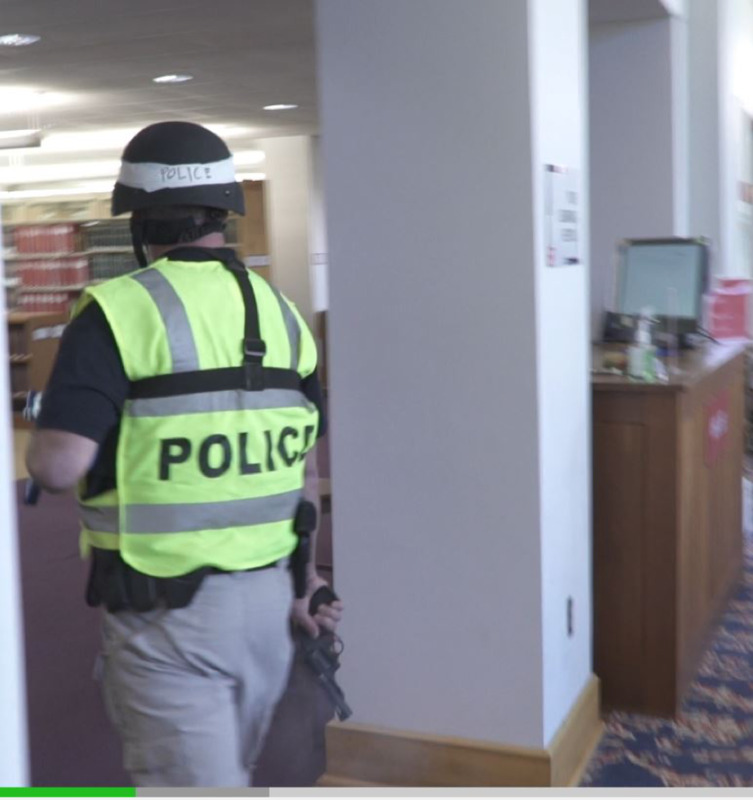 Samford University conducted what university officials have said was a successful active shooter training drill on March 8. The drill included a test of the campus-wide lockdown procedures. The training drill, which had been in the planning stages for more than a year, included officials from the Jefferson County Emergency Management Agency and the City of Homewood (Alabama) Fire and Police Department and the Homewood Fire Marshal’s office. The university regularly conducts training drills with various scenarios to test the effectiveness of its Integrated Emergency Management Plan (IEMP). Also, Samford’s College of Health Sciences conducts an annual disaster simulation drill each spring as part of its academic programming. “Although we have been planning this drill and scenario for more than a year, recent tragic events in other locations made it even more important and timely,” said Harry B. Brock III, Samford’s executive vice president and vice president for business and financial affairs. Brock serves as the university’s emergency manager. The purpose of the active shooter drill was multi-faceted and included communication to students and employees about the appropriate steps to take in an active shooter situation, a test of the university’s ability to lock down the campus and awareness of recognizing and reporting early warning signs of someone who could bring danger to the campus. Brock also noted that it was an important training opportunity for the university’s Department of Public Safety and Emergency Management. Brock sent multiple communications to students and employees in the weeks leading up to the drill to provide information about preparation for an actual emergency. The drill included the use of a role-playing shooter who is a member of the university’s public safety staff. Brock explained that the U.S. Department of Homeland Security recommends that one of the drill components should be training people on what a firearm discharged inside a building sounds like. That was one of the significant purposes of the drill. Samford’s IEMP has been operational for several years, according to Kimberly Brown, Samford’s associate vice president for operations and campus projects. As deputy emergency manager, Brown coordinated planning for the drill and leads regular training exercises to ensure the university’s emergency readiness. Brown said the university would continue to review experiences learned from the drill through a series of campus forums in the weeks ahead that will be open to students and employees. The university also will be reviewing valuable feedback received from community partners. “We are grateful for the community partners who assisted us with this drill and with whom we regularly work as part of our emergency preparedness,” Brown added.